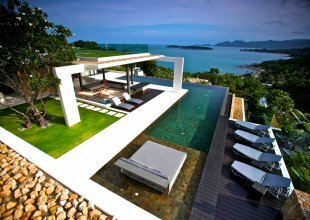 Villa Hin is located in a secluded private community 5-minutes away from the famous Chaweng Beach. Its unique open-space architecture integrated to the nature attached to a giant rock, surrounded by green plants and trees is something that would make you feel close very to the nature which is perfect for relaxation. The best part about staying at this villa is the beautiful ocean view that greets you everyday and every morning you wake up. The incredible Villa Hin Samui uses a unique natural rock formation as the foundation of its design, which is the main reason it has become known as the Rock House. The striking and creative architectural design of the villa is not only one-of-a-kind; the atmosphere it creates is one of tranquillity, seclusion, and relaxation surrounded by a tropical paradise. The structure is a prime example of embracing the beauty of the natural surroundings and incorporating it into the overall design. Individual rooms of the structures are constructed with an open air design, bringing the cool tropical breezes in and creating an incredibly open and relaxed living space like no other. In addition to the remarkable atmosphere at the Villa Hin Samui, the luxurious amenities included are outstanding and second-to-none. N.B. Minimum 3 night stay, please enquire for preferred duration. Well-Situated directly adjacent to the swimming pool is an enchanting living room the features comfortable and ergonomically designed lounge chairs and a private bar with spectacular views of the colossal pool and surround area. The living quarters are centrally located and will surely be a focal point of your stay. The Dining area features a rectangular table with comfortable seating for up to eight people. The modern kitchen is fully equipped and includes up-to-date appliances, and the interior includes a bar that runs artfully between the modern kitchen and dining area. The bedrooms include a massive comfortable bed, a balcony with stunning views of tropical flowers against ocean blue waters, en suite tile bathrooms, a relaxing lounge area, stunning stone and tile work, and elegant gardens that combine to create a private and tranquil atmosphere you will remember for years to come. The pool impeccably decorated and surrounded by well-placed shrubs, privacy garden trees, and a beautiful assortment of tropical flowers. Guests enjoy the L-shaped pool and lounge at the water’s edge, which is ideal for parties, relaxing poolside, or taking a leisurely swim or even an endurance workout – All of this with spectacular views overlooking Coral Bay.